When the Oscars were announced in January, I was surprised that Dev Patel was nominated in a supporting role rather than a starring one. I mean, he was clearly the star of Lion, wasn’t he? It seemed like one of those situations where someone is stepped down in a category specifically to give him a better chance of winning. Now that I’ve seen the movie, I understand the reasoning here. This is clearly Patel’s movie in the second half, but that’s because he doesn’t appear in the first half at all. 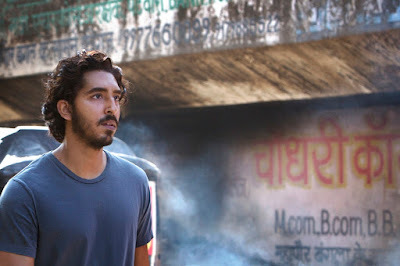 Lion is the story of Saroo Brierly (played by Dev Patel as an adult and by Sunny Pawar as a child). At five, Saroo lived in Khandwa, India, where he and his older brother Guddu (Abhishek Bharate) steal coal from trains to trade for milk and food. One night, Saroo is to stay home while Guddu goes out and works for the money the family desperately needs. Saroo convinces his brother that he should come along and help, and eventually Guddu relents. But Saroo really is too young and falls asleep. Guddu leaves him on a bench at a train station, telling his brother to stay and wait for him. When Saroo wakes up, he is alone. Thinking his brother must be on the train he sees, Saroo boards, and the train pulls out of the station, travelling over several days to Kolkata (or Calcutta, if you prefer). Unfamiliar with the local language and otherwise uneducated and not really sure where he lives, Saroo has no way to get home. Instead, he survives on the streets until he is eventually discovered and put in an orphanage. When no leads regarding his family turn up, he is adopted out to the Brierly family in New Zealand. Since he is young Saroo soon adapts to his new world and environment and learns to consider John (David Wenham) and Sue (Nicole Kidman, who was nominated for a supporting role) as his parents. As an adult, Saroo goes off to college to study hotel management. It is here he meets Lucy (Rooney Mara). At a party, Saroo encounters jalebi, a fried dough soaked in sugar syrup, that he always craved as a child. In that moment, his entire past flashes back to him, and he becomes suddenly desperate to find his family in India. He realizes that his mother and his siblings must have been looking for him for 25 years, never knowing what became of him or even if he was still alive. Using what little he remembers and with the liberal assistance of Google Earth, Saroo tries to reconstruct his train journey from decades before to see if he can track down where he was from and whether or not his family is still alive. It’s impossible, I think, not to be moved by the story. In many respects, Saroo Brierly was staggeringly lucky to be rescued from his life on the street and to be raised by loving parents. But his quest to discover his family and connect with the life he once had is completely understandable as well. Patel plays this not as a man possessed, but a man obsessed, blind to everything until he finds what he has lost, even ignoring his relationship with Lucy in his quest to discover his family. Lion is one of those films that calls into question the very categories that Oscar awards every year. I’ve taken the stance on this blog that there should be a category for stunt work as well as one for voice acting every year, two areas of filmmaking that Oscar has ignored since the inception of the awards. A third area is that of child actors. I take no issue with the nominations for both Dev Patel and Nicole Kidman. Sunny Pawar deserves a huge amount of the credit for making this film work as well. He gives one of the best child performances of the current decade here, and that deserves some recognition. It wouldn’t be fair to include him in a competitive category with adults, but a category for child performances seems warranted, and Pawar would get my vote for 2016 in a heartbeat. If there is a problem with Lion, it’s that it turns out to be a very straightforward story. We see the young life of Saroo, and then jump forward to his sudden memory of his past and his desire to find his family. I understand that this is based on a true story, but the story that we are presented is pretty linear. It didn’t detract from the film for me at all, but I can certainly see how someone might object to the fact that Lion doesn’t contain much in the way of real complexity. But that’s my only complaint. I found the story incredibly moving all the way through, both in the struggles of young Saroo and the emotional journey for Saroo as an adult. I can be pretty oblivious to the charms of many “triumph of the human spirit” stories, but not this one, which hit me square in the chest. I’m happy I had the chance to see it, because it’s very much a story worth seeing. Why to watch Lion: Where do you begin on trying to explain this story? Why not to watch: No good reason. Really. This one's definitely on my list. Thanks for the review. It's very much worth the time. While there are no twists and turns, those aren't always necessary for a compelling story, and that lack didn't bother me at all. Well acted, well filmed, and consistently interesting. I found this one just ok. I generally have some trouble with movies where the protagonist doesn't actually do anything other than survive events happening around him (or her), and let's face it, the first half of this film is documentary-like. Sure, what 5 year-old Saroo endures is horrible, but the first part of Lion is a stark look at the life of street children in India rather than a cinematic drama. The second half was a bit better, but as you said, straightforward and mono-tonal. A bit too much moping around for my liking. Definitely agree with the idea for a child actor Oscar category. Honestly, that's my biggest takeaway from this film. Oscar needs to expand. I get what you're saying, and for a less compelling story, I'd agree with you completely. In this case, I think the story is strong enough that I don't notice the issues as much.